Great, truck, space to take the whole family, dog, gear for sports and hobbies. Amazing family truck. There is room for 8, plus everyone's gear and hobby stuff. I wish it did not have carpet, with kids, mountains, lakes, beach's, it is hard to clean. Feel safe, controls and handles nicely. I wish it had more hidden compartments like the new van, maybe a cooler or just storage. It is a amazing truck and I brag about the space all the time. We are running at 293, 000 miles and still going strong. Some electronics are starting to fail. I will be buying another sub in the future. It has been comfortable and reliable since we purchased it in 2007 with 200 miles, I would purchase it again. Feel safe on highway no matter the weather it gets me where I want to go. Sunshine rain, ice, snow. I did not like the first set of tires it came with they planed in the rain and even with the 4 x4 it still was slick I would not like these tire again. With the tires I have purchased over the years, better quality, and traction. Thank you Chev for getting my family where it needs to go. I can not ride in a low to the ground car, I feel very unsafe. 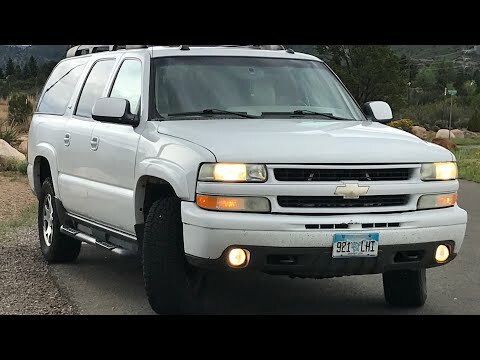 Chevrolet Suburban is fantastic!! Has all of the bells & whistles that I need. I really love my Chevrolet Suburban!! It is 13 years old and still drives like a charm. The heated leather seats are quite nice and when you put on the turn signal the arrow on the side mirror comes on. The Bose stereo system is fantastic and the CD player has 6 slots so there's plenty of music. There is also a DVD player in the back which was very handy when the kids were younger and for long trips. The sunroof works and it is nice to open it up in the nice weather. The gas tank is huge!! It takes a lot to fill it up but gets good gasoline mileage on the freeway. There is more than enough rooms in the back for groceries and luggage on a trip. It seats 8 with plenty of room. I'd buy another one just like it 😊. Love my suburban! Highly recommend suburban for large families/ long trips. I love my suburban. It is really comfortable. With 3 bench seats I have plenty of room for 1 driver plus 8 passengers. Of course the person in the front middle seat needs to be smaller. The trunk is huge. I easily fit groceries, sports equipment, strollers, small bikes, coolers, suitcases in there without sacrificing any passenger seating. The bench seats do lift out if you need to transport large items like furniture. I did have to replace the transmission at around 200, 000 miles.